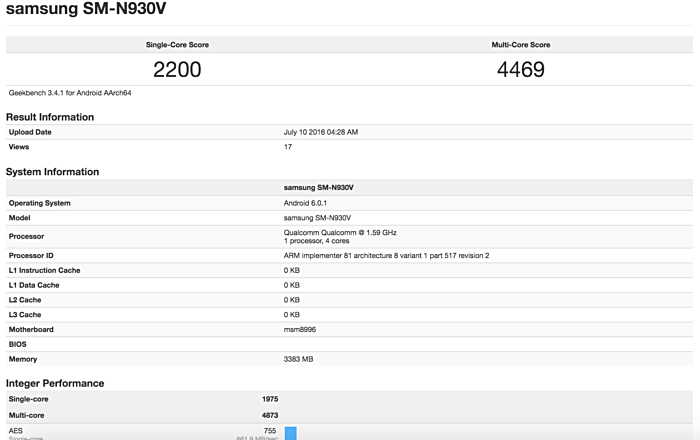 Just a few days after it was spotted on AnTuTu, the Samsung Galaxy Note7 (SM-N930V) - which in all likeliness is the Verizon variant - has now appeared on Geekbench. The listing reveals SD820 SoC with quad-core 1.59GHz CPU, 4GB RAM, and Android 6.0.1 Marshmallow OS. The specs are completely inline with what AnTuTu revealed, which also included QHD (2560x1440 pixels) display, 64GB internal memory, as well as a 13MP main camera unit and a 5MP front shooter. It's worth mentioning that another Note7 model (SM-N930F) was also previously spotted on Geekbench, revealing a completely different set of specifications, including octa-core 1.5GHz CPU, 3GB RAM, and Android 7.0 Nougat. You high, bro? Yeah! You high!